It can be difficult to find ways of engaging members of the public in your research, particularly when you are an early career researcher. The University of York runs a competition called Spotlight that provides a platform for PhD students to promote their research to the general public and other academics. Spotlight runs every year to coincide with a public engagement event called ‘York Talks,’ which invites members of the public to listen to short talks about the research taking place within the University of York. PhD students from across the university are invited to apply to have the opportunity to exhibit their research at the York Talks event, under the banner of the Spotlight Competition. This year nine finalists were selected from across the university; three from natural sciences, three from arts and humanities, and three from social sciences. I was really pleased to be selected as a finalist from the social sciences faculty. As a finalist I had to design and prepare a display which explained my research in an accessible and engaging way. 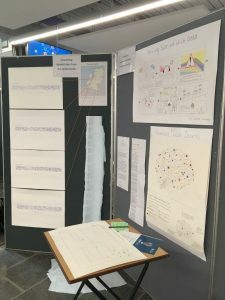 As well as designing a poster which informed people about my research, I included a combination of hand drawn and digital data visualisations in my display and invited people to interpret and respond to them. I wanted to include both digital and analogue examples of data visualisations to encourage people to think about the subjectivities inherent in every data set. I wanted people to question the notion that data has to be big, technical and automated, whilst asking them to think about how the subjectivities in small, analogue and personal data might also be present in much larger, digital data sets. We spent the day of the competition stood at our stands, talking to members of the public about our projects. I really enjoyed talking to people about my research, explaining why it is important and how it will have impact beyond academia. Throughout the day I received some challenging questions from people, and some interesting responses to the visualisations I had displayed, which was really fascinating. The more I talked to people about my research the more confident I became at telling them about it, as well as the impact that I hope it will have within both academia and the field of data visualisation design. Among the public who were visiting our stands were three judges. The judges walked round the finalists separately throughout the day, assessing our displays and the way we explained our research to them. At the end of the day the winners of the Spotlight competition were announced. I was thrilled to receive both the prize for the Social Science faculty, and to be announced the overall winner. The Spotlight experience has made me even more committed to engaging the public in my research. It was a really rewarding experience and further underlined to me the importance of getting our research to people beyond the academy.